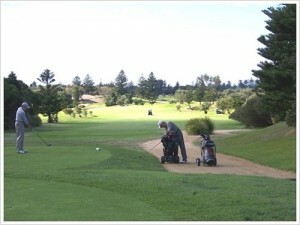 The opening drive of your round is to a generous downhill fairway with plenty of room on the 2nd and 18th fairways. A well struck drive for the big hitters gives you the option to attack the green with your second shot or to lay up next to the fairway bunkers. For those who shoot for the green, you will require a right to left shaped shot to avoid the trees which guard both sides of the fairway. For those who take the conservative route, a lay up next to the fairway bunkers will provide you with a third shot to the green of approximately 110 metres. The narrow green is protected by three bunkers to the right which requires and accurate shot to the green. Now you are playing the most challenging hole on the course. The second hole is long and being uphill adds to the length of this challenging par four. There are two fairway bunkers on the right which must be avoided as very few golfers will be able to reach the green with their second shot from these deep fairway bunkers. Once finding the fairway, the next goal is to ensure you don’t miss this green to the left as there are three bunkers waiting to catch your ball. The green slopes severely from left to right and from back to front, so ensure you keep your ball below the pin. This downhill par 4 offers a generous fairway which is guarded by a deep fairway bunker to the left and for those who hit the ball right to left, beware of the out of bounds. From the fairway the ideal approach to the green, is a right to left shot which allows you to attack the pin which is guarded by two bunkers at the front and one to the rear. The green has a ridge running through the middle so it’s important for your approach shot to finish on the correct side to allow for an easier putt. This uphill par 3 is deceptively difficult. Whilst only 133 metres, the wind plays a large part in the difficulty of this hole as you can’t always feel the strength of the breeze from the tee. Once you hit over the pond, the green is protected by two bunkers to the left as well as a deep swale between them. The right side is protected by a deep bunker and the lateral hazard runs the complete left side of the hole and the back of the green. If you happen to miss the green, the best place is short. 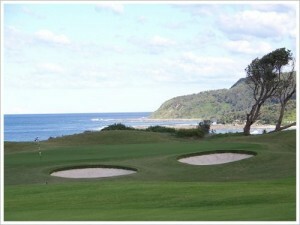 The fifth hole runs south and parallel to the ocean. On a summers afternoon the wind really starts to affect your ball with the traditional north easterly breeze blowing. A blind tee shot and out of bounds to the left requires an accurate tee shot. The green is protected by two bunkers to the right and using the correct club is important to ensure your ball is on the correct tier. 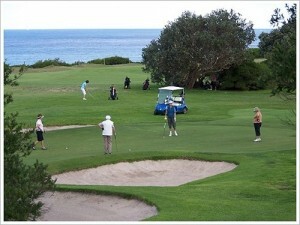 The sixth hole is easily the most spectacular on the course with magnificent ocean views to your left. You need to think your way through the sixth hole. The fairway is guarded by a shallow fairway bunker to the left as well as out of bounds running the full length of the hole. 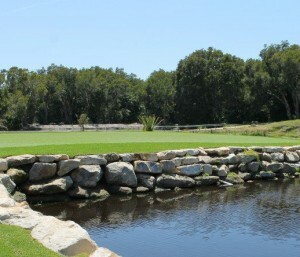 At 100 metres from the green the fairway drops away and the water hazard comes into play. The safest tee shot is hit 220 metres to the right centre of the fairway which allows for a shot of 110 metres to a green which is guarded by four deep bunkers to the left. There is a large swale sloping from right to left through the middle of the green, so ensure you select the correct club to give you the best chance of holing your birdie putt. This is the most demanding tee shot on the course. 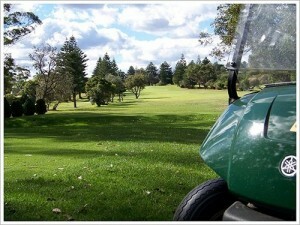 You must avoid the thick trees to the left of the fairway as well as the small cluster of melaleuca trees to the right. From the fairway an accurate shot to the green is required to avoid the front right bunker as well as the two bunkers to the left. Also do not go long as the rear of the green slopes away severely. This straight uphill par 4 is lined with pine trees on both sides of the fairway. Selecting the correct club for your second shot is important to ensure the best chance of holing your birdie putt on this two-tiered green. Beware of the ‘hidden’ bunker to the rear of the green. The ninth hole is the newest hole at SBGC and is a tough par 3. 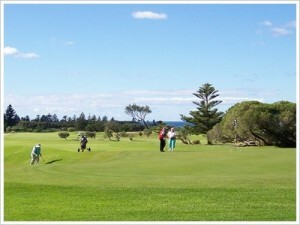 The green is 40 metres long and is protected by a deep bunker at the front of the green and a bunker long left. If you miss the green, the suggested bail out area is left of the green which is your best chance of getting up and down for par. The green has subtle breaks with fall towards the ocean. After completing the front nine at SBGC, grab yourself a well earned drink and bite to eat at the bottom bar in preparation for the back nine. This short downhill par 3 requires the correct club selection. Whilst short of the green provides an easy up and down for par, any ball to the left or long of the green provides a challenging chip shot. A significant slope behind the green may force your ball out of bounds or at best, finish against the fence. The eleventh hole is one of the longest on the course. A well struck straight drive is required as the melaleucas are to the right of the fairway and pine trees line the left side. Correct club selection is important as the green is long and the tier at the back of the green provides a tough challenge when the pin is back. 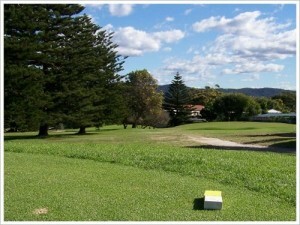 There are two bunkers which guard the left side of the green and the green slopes away on the right. The twelfth hole rates as the most difficult hole on the back nine. 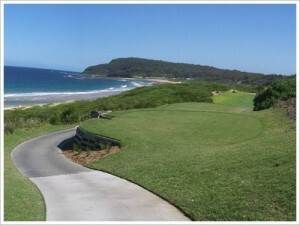 It measures over 400 metres uphill and has a slight dogleg to the left which makes the hole even more difficult. 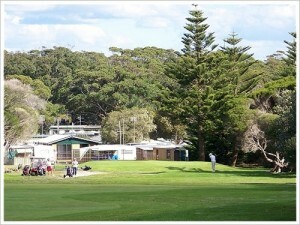 An accurate drive is required as the melaleucas are on the right side of the fairway with pine trees to the left. The green is large and unprotected at the front which allows for your ball to run onto the green from the fairway but bunkers guard the left and rear of the green. The thirteenth hole has one of the most challenging greens on the course. Correct club selection is important as the green slopes severely from back to front, therefore you are best to keep your ball below the hole. If you miss the green, the safest place is short as a ball that misses the green to the left, right or long provides a very difficult chip. The green is guarded by a bunker front right and left side with the raised green sloping away on all sides. The wind can also be a factor as you can’t feel how strong the breeze is from the tee. The fourteenth hole is a long, straight downhill par 4. 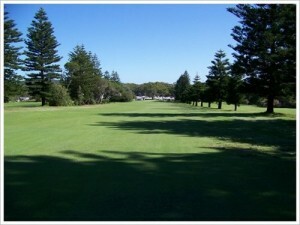 Pine trees and melaleucas line both the left and right sides of the fairway. The green slopes from back to front and the best place to miss the green is short as this is the easiest place to chip from. The green is guarded by a deep bunker to the right. Ensure you select the correct club as a ball finishing over the green can roll hard up against the fence. 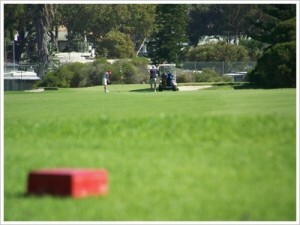 The fifteenth hole provides you with one of the best birdie opportunities on the course. This short par 5 is reachable in two shots providing you can find the fairway with your drive. 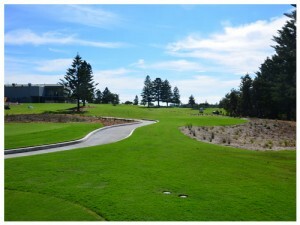 The fairway is lined with melaleucas to the right and pine trees line both the left and right sides. Two large fairway bunkers guard the left side of the fairway in the landing zone from the tee, which helps protect the length of this short par 5. 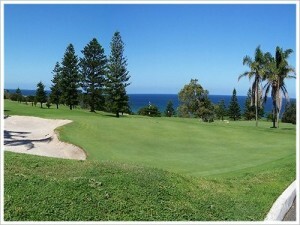 The green is very narrow with a steep front and it is well bunkered to the left, right and rear. If you prefer to play the hole conservatively, you can position your drive short of the fairway bunkers and then lay up with your second shot to a distance that best suits your preferred pitching distance. Be careful not to put too much spin on your pitch to the green as a spinning ball can disappear off the front of the green. There are several options to playing this picturesque par 4. If you are aggressive and select your driver from the tee, be wary of the pond to the right of the fairway and the fairway bunker to the left. Should you choose the conservative route, you can hit your tee shot down the left side of the fairway so your ball rolls over the slope in the fairway and finishes inside 100 metres to the green. This leaves you with an uphill shot to the green. The best option is to lay up to the left side of the fairway, approximately 120 metres to the green which allows you to see the bottom of the pin from the fairway. The green slopes severely from left to right and back to front with two tiers which add to the challenge of playing this short par 4. Two deep bunkers guard the right side of the green. Another short par 4 which gives you the option to attack with your driver but be wary of the cluster of trees to the right of the fairway as well as the tall pine trees to the left. 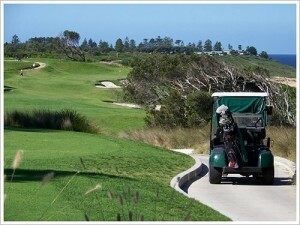 If you drive straight you are left with a short pitch to the green. Should you prefer a more conservative approach, you should aim to hit your tee shot to approximately 100 metres to the green which allows for a full shot to the green so you can put plenty of spin on the ball to stop it quickly. 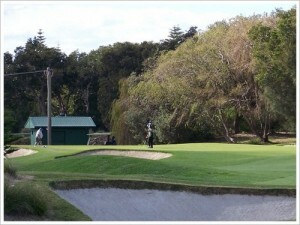 The green is narrow and has bunkers both sides and at the back. 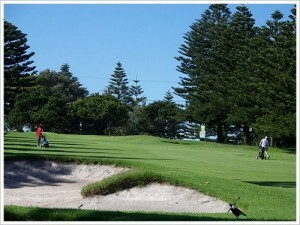 The eighteenth hole is the longest on the course and is made even more challenging by being uphill. 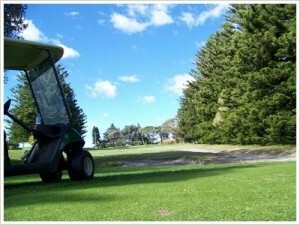 You will require a straight drive to avoid the cluster of trees on both sides of the fairway. A well struck fairway shot which avoids the tall pine trees to left of the fairway and trees to the right, will allow you the opportunity to attack the pin with a short iron for your third shot. Your third shot is uphill and can be difficult to judge how far back the pin is located. 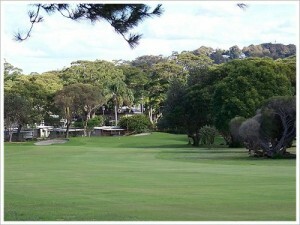 The green is guarded by a large bunker to the right and a deep bunker to the left. Once you’ve putted out, don’t forget to waive to those spectators on the balcony.